One of the benefits of the Space Age is the way it has allowed human beings to see Earth in all of its complexity and splendor. In addition, it has allowed us to conduct studies of Earth’s surface and atmosphere from orbit, which helps us to see the impact we have on our the planet. It is with this purpose in mind that NASA’s Earth Observation Program has been monitoring the Arctic and Antarctic for many years. For instance, Operation IceBridge has spent much of the past decade monitoring the Antarctic ice sheet for signs of cracks and flows. The purpose of this is to determine how and at what rate the ice sheet is changing due to Climate Change. Recently, NASA crews conducted a flight over the southern Antarctic Peninsula as part of Operation IceBridge ninth year, which resulted in some stunning pictures of the icy landscape. The flight took place on November 4th, 2017, as part of IceBridge’s “Endurance West” mission to study sea ice. The path they chose follows the ground track of NASA’s Ice, Cloud, and land Elevation Satellite-2 (ICESat-2), an ice-mapping satellite that is scheduled for launch in late 2018. 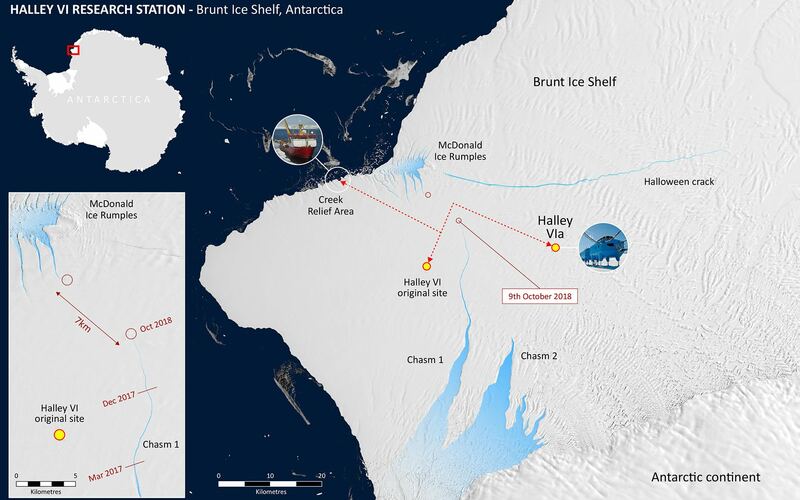 This path began at the northern tip of the Antarctic Peninsula and then moved southward across the Weddell Sea. Semi-permanent cracks on the Antarctic Peninsula. Credit: NASA/Digital Mapping System. The images the crew took aboard their P3 research plane were captured by a Digital Mapping System, a downward-pointing camera that collects thousands of high-resolution photographs during a single flight. While traveling over the southern Antarctic Peninsula, they imaged a landscape that resembled rapids, where the motion of rivers becomes amplified as the water flows through steeper, narrower terrain. In a similar fashion, as ice flows through narrower canyons and down steeper bedrock, more fractures appear at the surface. But of course, the rate at which this takes place is much slower, which can make discerning movement in the ice sheet rather difficult. The first image (shown above) shows ice flowing into the southern part of the George VI ice shelf, which is located in Palmer Land south of the Seward Mountains. In this location, cracks are likely to be a regular feature that form as the ice flows over the bedrock. However, since the ice flow is relatively slow (even on the steeper part of the bedrock), the surface cracks are not as dramatic as in other regions. For example, the second image (shown below), which shows a heavily crevassed glacier that measures about 21 km (13 mi) long and 11 km (7 mi) wide. The glacier appears to be flowing west from the Dyer Plateau to George VI Sound while the north side merges with the Meiklejohn Glacier. The third image (bottom) shows a heavily crevassed glacier north of Creswick Peaks that also flows west into George VI Sound. In short, the pictures confirm that ice on the southern end of the Antarctic Peninsula is flowing towards the ocean. The purpose of IceBridge, which has been conducting regular measurements in the Antarctic Peninsula since 2009, has been to study just how fast and to what extent Climate Change has been impacting the region. While ice sheet loss is a well-documented phenomenon, scientists have known for some time that the most dramatic losses in Antarctica occur along its western side. Knowing how significant the impact of Climate Change will be is the first step in developing countermeasures. It also serves as a stark reminder that the problem exists, and that solutions need to be found before it is too late. Beneath the Antarctic ice sheet, there lies a continent that is covered by rivers and lakes, the largest of which is the size of Lake Erie. Over the course of a regular year, the ice sheet melts and refreezes, causing the lakes and rivers to periodically fill and drain rapidly from the melt water. This process makes it easier for Antarctica’s frozen surface to slide around, and to rise and fall in some places by as much as 6 meters (20 feet). According to a new study led by researchers from NASA’s Jet Propulsion Laboratory, there may be a mantle plume beneath the area known as Marie Byrd Land. The presence of this geothermal heat source could explain some of the melting that takes place beneath the sheet and why it is unstable today. It could also help explain how the sheet collapsed rapidly in the past during previous periods of climate change. The study, titled “Influence of a West Antarctic mantle plume on ice sheet basal conditions“, recently appeared in the Journal of Geophysical Research: Solid Earth. The research team was led by Helene Seroussi of the Jet Propulsion Laboratory, with support from researchers from the Department of Earth and Planetary Sciences at Washington University and the Alfred Wegener Institute, Helmholtz Center for Polar and Marine Research in Germany. The motion of Antarctica’s ice sheet over time has always been a source of interest to Earth scientists. By measuring the rate at which the ice sheet rises and falls, scientists are able to estimate where and how much water is melting at the base. It is because of these measurements that scientists first began to speculate about the presence of heat sources beneath Antarctica’s frozen surface. The proposal that a mantle plume exists under Marie Byrd Land was first made 30 years ago by Wesley E. LeMasurier, a scientist from the University of Colorado Denver. According to the research he conducted, this constituted a possible explanation for regional volcanic activity and a topographic dome feature. But it was only more recently that seismic imaging surveys offered supporting evidence for this mantle plume. However, direct measurements of the region beneath Marie Byrd Land is not currently possible. Hence why Seroussi and Erik Ivins of the JPL relied on the Ice Sheet System Model (ISSM) to confirm the existence of the plume. This model is essentially a numerical depiction of the physics of the ice sheet, which was developed by scientists at the JPL and the University of California, Irvine. To ensure that the model was realistic, Seroussi and her team drew on observations of changes in altitude of the ice sheet made over the course of many years. These were conducted by NASA’s Ice, Clouds, and Land Elevation Satellite (ICESat) and their airborne Operation IceBridge campaign. These missions have been measuring the Antarctic ice sheet for years, which have led tot he creation of very accurate three-dimensional elevation maps. Seroussi also enhanced the ISSM to include natural sources of heating and heat transport that result in freezing, melting, liquid water, friction, and other processes. This combined data placed powerful constrains on the allowable melt rates in Antarctica, and allowed the team to run dozens of simulations and test a wide range of possible locations for the mantle plume. What they found was that the heat flux caused by the mantle plume would not exceed more than 150 milliwatts per square meter. By comparison, regions where there is no volcanic activity typically experience a feat flux of between 40 and 60 milliwatts, whereas geothermal hotspots – like the one under Yellowstone National Park – experience an average of about 200 milliwatts per square meter. Where they conducted simulations that exceeded 150 millwatts per square meter, the melt rate was too high compared to the space-based data. Except in one location, which was an area inland of the Ross Sea, which is known to experience intense flows of water. This region required a heat flow of at least 150 to 180 milliwatts per square meter to align with its observed melt rates. In this region, seismic imaging has also shown that heating might reach the ice sheet through a rift in the Earth’s mantle. This too is consistent with a mantle plume, which are thought to be narrow streams of hot magma rising through the Earth’s mantle and spreading out under the crust. This viscous magma then balloons under the crust and causes it to bulge upward. Where ice lies over top of the plume, this process transfers heat into the ice sheet, triggering significant melting and runoff. In the end, Seroussi and her colleagues provide compelling evidence – based on a combination of surface and seismic data – for a surface plume beneath the ice sheet of West Antarctica. They also estimate that this mantle plume formed roughly 50 to 110 million years ago, long before the West Antarctic ice sheet came into existence. Roughly 11,000 years ago, when the last ice age ended, the ice sheet experienced a period of rapid, sustained ice loss. As global weather patterns and rising sea levels began to change, warm water was pushed closer to the ice sheet. Seroussi and Irvins study suggests that the mantle plume could be facilitating this kind of rapid loss today, much as it did during the last onset of an inter-glacial period. Understanding the sources of ice sheet loss under West Antarctica is important as far as estimating the rate at which ice may be lost there, which is essentially to predicting the effects of climate change. Given that Earth is once again going through global temperature changes – this time, due to human activity – it is essential to creating accurate climate models that will let us know how rapidly polar ice will melt and sea levels will rise. It also informs our understanding of how our planet’s history and climate shifts are linked, and what effect these had on its geological evolution. Located along the east coast of the Antarctic Peninsula is the Larsen Ice Shelf. Named after the Norwegian Captain who explored the ice front back in 1893, this ice shelf has been monitored for decades due to its close connection with rising global temperatures. Essentially, since the 1990s, the shelf has been breaking apart, causing collapses of considerable intensity. According to the British Antarctic Survey (BAS), the section of the ice sheet known as the Larsen C Ice Shelf could be experiencing a collapse of its own soon enough. Based on video footage and satellite evidence of the sizeable rift (which is 457 m or 15oo ft across) in the shelf, it is believed that an ice berg that is roughly 5,000 km² (1930.5 mi²) in size could be breaking off and calving into the ocean in the near future. An ice shelf is essentially a floating extension of a land-based glacier. In this case, the Larsen Ice Shelf is seaborne section of the larger Larsen Glacier, which flows southeast past Mount Larsen and enters the Ross Sea just south of Victoria Land. These shelves often act as buttresses, holding back glaciers that flow down to the coast, thus preventing them from entering the ocean and contributing to rising sea levels. In the past twenty-two years, the Larsen A and B ice shelves (which were situated further north along the Antarctic Peninsula) both collapsed into the sea. This resulted in the dramatic acceleration of glaciers behind them, as larger volumes of ice were able to flow down the coast and drop into the ocean. While Larsen C appeared to still be stable, in November of 2016, NASA noted the presence of a large crack in its surface. This crack was about 110 kilometers (68 mi) long and was more than 91 m (299 ft) wide, reaching a depth of about 500 m (1,600 ft). By December, the rift had extended another 21 km (13 mi), which raised concerns about calving. In February of 2017, satellite observations of the shelf noted that the crack appeared to have grown further, which confirmed what researches from the MIDAS project had previously reported. This UK-based Antarctic research project – which is based at Swansea University and Aberystwyth University in Wales and supported by the BAS and various international partners – is dedicated to monitoring the Larsen C ice shelf in Antarctica. Through a combination of field work, satellite observations, and computer simulations, they have catalogued how recent warming trends has caused seasonal melts of the ice shelf and affected its structure. And in recent years, they have been monitoring the large crack, which has been fast-moving, and noted the appearance of several elongations. It was during the current Antarctic field season that members of the project filmed what the crack looked like from the air. In previous surveys, the glaciology research team has conducted research on the ice shelf using seismic techniques to survey the seafloor beneath it. However, this past season, they did not set up on the ice shelf itself for fear of a calving event. Instead, they made a series of trips to and from the UK’s Rothera Research Station aboard twin otter aircraft. During an outing to retrieve some of their science equipment, the crew noted how the crack looked from above and started filming. As you can see from the footage, the rift is very wide and extremely long. What’s more, the team estimates that if an iceberg from this shelf breaks off and falls into the ocean, it will likely be over three times the size of cities like London or New York City. And while this sort of thing is common with glaciers, the collapse of a large section of Larsen C could speed the flow of the Larsen Glacier towards the Antarctic Ocean. One of the greatest concerns about climate change is the feedback mechanisms it creates. In addition to increased warming trends caused by rising levels of CO² in the atmosphere, the melting of glaciers and the breakup of ice shelves can have a pronounced effect on sea levels. In the end, the depletion of glaciers in Antarctica could have dramatic consequences for the rest of the planet. 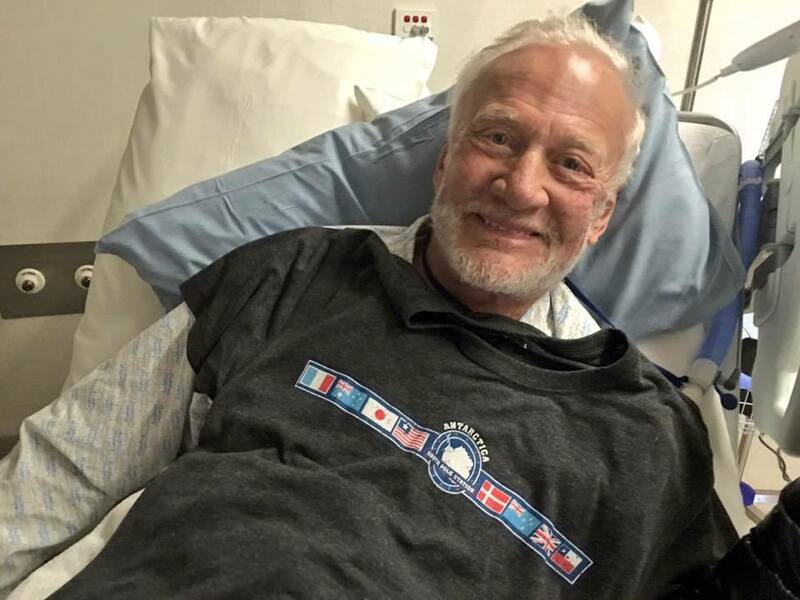 Buzz Aldrin – the second man to walk on the Moon – is recovering nicely today in a New Zealand hospital after an emergency medical evacuation cut short his record setting Antarctic expedition as the oldest man to reach the South Pole – which Team Buzz lightheartly noted would make him “insufferable”! “He’s recovering well in NZ [New Zealand],” Team Buzz said in an official statement about his evacuation from the South Pole. Apollo 11 moonwalker Buzz Aldrin, who followed Neil Armstrong in descending to the lunar surface in 1969 on America’s first Moon landing mission, had to be suddenly flown out of the Admunsen-Scott Science Station late last week per doctors orders after suffering from shortness of breath and lung congestion during his all too brief foray to the bottom of the world. He was flown to a hospital in Christchurch, New Zealand for emergency medical treatment on Dec. 1. “Buzz Aldrin is resting in hospital in Christchurch, New Zealand. He still has some congestion in his lungs so has been advised not to take the long flight home to the States and to rest in New Zealand until it clears up,” Team Buzz said in an official statement on Dec. 3. Buzz had been at the South Pole for only a few hours when he took ill, apparently from low oxygen levels and symptoms of altitude sickness. “I’m extremely grateful to the National Science Foundation (NSF) for their swift response and help in evacuating me from the Admunsen-Scott Science Station to McMurdo Station and on to New Zealand. I had been having a great time with the group at White Desert’s camp before we ventured further south. I really enjoyed the time I spent talking with the Science Station’s staff too,” said Aldrin from his hospital room in a statement. Prior to the planned Antarctic journey, his doctors had cleared him to take the long trip – which he views as “the capstone of his personal exploration achievements”. Buzz’s goal in visiting the South Pole was to see “what life could be like on Mars” – which he has been avidly advocating as the next goal for a daring human spaceflight journey to deep space. “His primary interest in coming to Antarctica was to experience and study conditions akin to Mars that are more similar there than any other place on earth,” Team Buzz elaborated. He had hoped to speak more to the resident scientists about their research but it was all cut short by his sudden illness. “I started to feel a bit short of breath so the staff decided to check my vitals. After some examination they noticed congestion in my lungs and that my oxygen levels were low which indicated symptoms of altitude sickness. This prompted them to get me out on the next flight to McMurdo and once I was at sea level I began to feel much better. I didn’t get as much time to spend with the scientists as I would have liked to discuss the research they’re doing in relation to Mars. My visit was cut short and I had to leave after a couple of hours. I really enjoyed my short time in Antarctica and seeing what life could be like on Mars,” Aldrin explained. Buzz also thanked everyone who sent him well wishes. “Finally, thanks to everyone from around the world for their well wishes and support. I’m being very well looked after in Christchurch. I’m looking forward to getting home soon to spend Christmas with my family and to continue my quest for Cycling Pathways and a permanent settlement on Mars. You ain’t seen nothing yet!”, concluded Aldrin. I recently met Buzz Aldrin at the Kennedy Space Center Visitor Complex in Florida, as part of the Grand Opening of the new ‘Destination Mars’ attraction. Destination Mars is a holographic exhibit at the Kennedy Space Center visitor complex in Florida. Be sure to catch it soon because the limited time run end on New Year’s Day 2017. The new ‘Destination Mars’ limited engagement exhibit magically transports you to the surface of the Red Planet via Microsoft HoloLens technology. It literally allows you to ‘Walk on Mars’ using real imagery taken by NASA’s Mars Curiosity rover and explore the alien terrain, just like real life scientists on a geology research expedition – with Buzz Aldrin as your guide. And Buzz seemed quite healthy for the very recent Grand Opening of the new ‘Heroes and Legends’ exhibit on Nov. 11 at the Kennedy Space Center Visitor Complex.